Crystal Mansion: Large, 7 Bedroom, 6 Bath home, Sleeps up to 26, close to beach! This beautiful luxury home is only 5 homes from the beach and sleeps up to 26 people - perfect for 5-6 couples with children, or all adult groups of 14 max. Welcome to your favorite beach home in Crystal Beach! This home received some big upgrades for 2018, from fresh paint to new bedroom furniture and a 4-PASSENGER GOLF CART! Your group will appreciate having 7 BEDROOMS and 6 FULL BATHROOMS. There are a total of 5 King Master Bedrooms, a bedroom with 3 Queen beds (with new private ensuite bathroom) and another bedroom with 2 sets of full-over-full bunk beds (yes, that's 4 full-size beds). You can see why we have many guests who return to this home every year! This amazing home has everything you could want and more in a luxury vacation home for a large group – a huge custom kitchen, inviting living, dining and gathering spaces, and a nice private pool and backyard. There’s a separate 2-story carriage house and spacious outdoor grilling and dining area, all just steps away from the pristine white sand of Crystal Beach. We keep this home clean and well updated, and pay attention to amenities that you expect, such as high-speed wireless internet (free wifi), high definition cable TV, big, fluffy bath towels and hair dryers in each bathroom, and more. We also provide items our smaller guests may need like a high chair and pack-n-play. Everyone will feel right at home when you gather in the inviting open spaces on the first floor of this amazing home. You'll love the leather sectional and comfortable chairs so you can sit and watch the TCL Roku Smart TV above the fireplace. There is a new dining table that seats 12, with lots of extra seating at the kitchen bar. The open kitchen is a chef’s dream with cabinets and granite counters galore. This custom space boasts beautiful tile floors, new stainless steel appliances, including a refrigerator with 2 ice-makers, a roomy pantry and most everything you’ll need to feed your crowd. This beautiful space comes equipped with plenty of dishes, pots and pans, serving dishes and utensils. There’s a Keurig K-Cup coffee maker, as well as a regular drip coffee maker. You’ll find a blender, toaster, and even a crock-pot in this well equipped kitchen. We also supply many “extras” such as cleaning products, trash bags, aluminum foil, plastic wrap, sugar, creamer and spices. For your convenience, there’s a large capacity, front-loading washer and dryer in the main house, and another stackable set in the Carriage House. This large, comfortable master bedroom has an inviting KING BED, night stands and lamps. There’s an extra-large dresser and walk-in closet for storage, as well as an armoire with TV. The high windows allow for both light and privacy and you’ll appreciate the well-appointed attached bathroom. With access from the King Master and the hallway, this beautiful full bathroom includes a large vanity, commode and beautiful tile tub/shower combination. You’ll also find big, fluffy bath towels and a personal hair dryer. An incredible 4-poster KING BED is the centerpiece of this large master suite. The sleeping area includes nightstands and reading lamps and the seating area has a full-size sleeper sofa, a chair with ottoman, and an armoire with a TV. You’ll appreciate the double closets, ATTACHED PRIVATE BATH, and the private access to the spacious front balcony with comfortable seating and ocean views! This beautiful master bathroom features double sinks, a large, brand new custom shower, and a private commode room. Guests in this lovely bedroom will appreciate the NEW KING BED, nightstand with reading lamp, a TV, and the ATTACHED PRIVATE BATHROOM. A private ensuite for King Master #3, this beautiful new bathroom features a large vanity, commode and tile tub/shower combination. There are big, fluffy bath towels and a personal hair dryer here too. Children, teens, and adults alike love this great room with 3 QUEEN BEDS. You'll find a TV in here, as well as a brand new ATTACHED PRIVATE BATHROOM. A private ensuite for the Triple Queen Bedroom, the bathroom features a vanity, a brand-new walk-in shower and a private commode room. Another favorite space for children is this Carriage House bedroom with 2 full-over-full bunks (yes, that's 4 full-size beds). There’s also a small dresser, TV and a walk-in closet. This lovely bedroom features a comfortable KING BED, a roomy closet and a bedside table with reading lamp. You can relax in here with the HDTV. A stackable washer and dryer are conveniently located in the closet. This bedroom opens to the small fenced backyard – a great space for small children or pets to play. The adjacent kitchenette has a small refrigerator, sink, microwave, ice-maker and drip coffeemaker. This full bathroom is shared by the king master and bunk room. It features a vanity, commode and tub/shower combination. You’ll also find big, fluffy bath towels and a personal hair dryer. This space has a private outdoor entrance near the pool. You enter into a spacious open living area with a queen sleeper sofa, 2 swivel chairs, and a large TV. There’s a high top table and chairs next to the convenient kitchenette with refrigerator, sink, microwave and drip coffeemaker. For the safety of your children, there is also an alarm on the door to the pool. This beachy bedroom features a lovely KING BED with two nightstands and lamps. There’s also a wicker armoire with TV and an extra chair. Here’s another convenient full bathroom for Carriage House guests. It has a vanity with storage, commode and nice tub/shower combination. You’ll find the private, professionally maintained swimming pool nestled between the main house and the carriage house. The pool is approx. 12' x 20' and it’s all yours – enjoy it! Pool heat is available for an additional fee. There’s room to enjoy the Destin sunshine on lounge chairs or you can relax on the shaded upper deck near the main house. There’s a large gas grill too, for when you want to cook outside. The house is less than a block from the Tarpon Street beach access. We provide a cart with beach chairs and an umbrella, so you can roll your gear to the beach with ease. We are pet friendly and welcome your dogs in our home. Pre-approval and a pet fee apply. We know how difficult it is to find a vacation rental to suit your family’s needs, schedules and budget. We’re happy to assist you with the process of finding and booking the right place to stay for your vacation. We don’t leave you hanging—we do our best to get back to all email inquiries within an hour. We keep our calendars up-to-date and if this property is booked, we’ll see if another one of our properties may work for you. We know 'by owner' vacation rentals better than anyone, having been part of VRBO since its earliest days. These are high-end, very well maintained homes, not "just rentals". 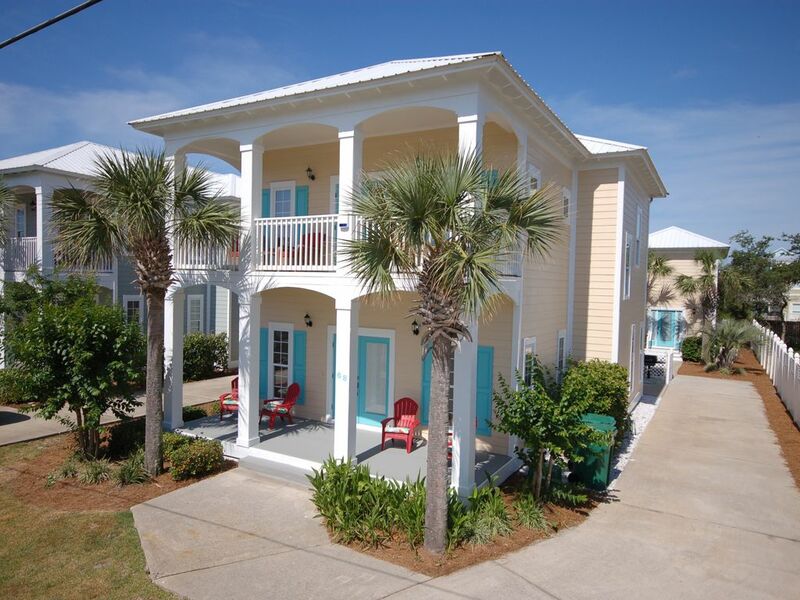 We live in Destin and greet all our guests, so we have to be proud of these homes. All of Destin's beaches are just amazing, but the Crystal Beach community is lower-density than other areas in Destin - no high-rise condos. It feels more like a quaint neighborhood with its white picket fences and sidewalks rather than a loud, busy resort area. Two-story carriage house, two master suites, huge kitchen, high level of finish, larger than average private pool for Crystal Beach, almost right on the beach. Great views of the beach and ocean from the balcony and yard. Central AC in main house and carriage house. New Dining Table, seats 12, more seating at large kitchen bar. Great Balcony off the Upstairs Master Bedroom on the shady side of the house. Pool heat is available for an additional fee. Location is A++ Had a few minor issues but rental agent was very accommodating and took every step to make things right. Beds were comfy and kitchen well stocked. Would recommend bringing your own beach chairs if you have more than 6 people. Would stay here again. My large family just rented this property and it was perfect - close to the beach, big, updated rooms, steps from the beach, pool - EVERYTHING! The management company was great too. Highly recommend! Thanks for your kind words, Amity! It was our pleasure to take excellent care of your family during your stay. And great news - this house just got a golf cart so there will be even more to look forward to the next time you stay! We'll look forward to it. We had a group of 13 which included two families and the grandma! Everyone had a comfortable room and there were plenty of bathrooms for the whole crew! The kitchen was roomy and provided ample space for 2-3 people to comfortably cook together without feeling cramped. There was plenty of seating at the table and bar so that our entire group could share meals together. The outdoor space was nice and had several different sitting areas that provided for group or private gatherings. The walk to the beach was short and the provided wagon and beach chairs was a nice treat. The washer and dryer provided opportunity to wash clothes and beach towels so that there was little to no laundry when we arrived home. We're happy to hear everyone enjoyed their stay. This home is a favorite place for large groups to enjoy time at the beach. With so many bedrooms spread between the main house and the two floors of the carriage house - it allows everyone to have a little space to themselves, but still be near the group. We work hard to make sure it's comfortable and well-equipped for all of our guests - and we make sure the kitchen is set up for a large group too. Thanks for taking the time to write a review -- I'm sure our future guests appreciate it too! Great house, close to the beach, private pool. We loved it! We had a great week long stay here and highly recommend it. Very quick, short walk to the beach at the end of the street. The house was very clean and had everything we needed. We absolutely LOVE this area of Destin. You've got the right idea by staying for more than a week, Jen! We're so glad your group enjoyed your time at Crystal Mansion. We have many other homes in this Crystal Beach neighborhood so if the size of your group changes we'll still have you covered. We're looking forward to your next visit! The house was 1 block from the beach, and a 2 minute drive to the shopping center and grocery store. The house was very clean. We believe we have the best housekeepers in Destin and we're glad it shows! We hope you'll book with us again the next time you come to the area - all of our homes are held to these same high standards. My family and I definitely enjoyed staying at this home. The house is very well-kept and very clean. It’s very accommodating for large families or groups. Guest services is very attentive and helpful. They made our stay very pleasant! The home is within walking distance to the beach which is an added bonus.!! Thanks Kamela - so glad you enjoyed your stay! Having the best properties in the best locations is only part of our story... Our Guest Services team is a big part of it too! As you mentioned, they take such great care of our guests. I believe they are a big reason why we have so many repeat guests! We'll look forward to your next stay. Rates are subject to change until booked. Rates quoted on this site are approximations - call or email us for an exact quote, or for any questions at all. We love to speak with our guests! Cleaning fee and 11% tax applies to all stays.